Other than the trellis netting, the bed construction is completely finished. 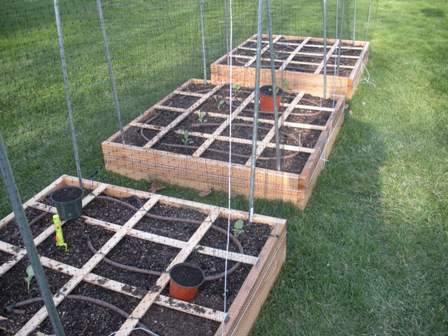 I hooked up the irrigation, installed the grid, and set up the deer net on the remaining three beds. It won’t be long, and I should be eating delicious, ripe vegetables straight from my garden! Most of the irrigation system set up and, while testing, I noticed some of the emitters on the drip line emit a high-pitched noise somewhere between the sound a tea kettle makes when boiling and the feedback from my great grandfather’s hearing aid. I am going to send an email to the supplier to see what they say, but I am assuming the problem is caused by dirt in the line or high water pressure. I didn’t have much time today, so I just started the leaf lettuce and romaine for this week, and played around with the irrigation system. I was trying to determine the least amount of pipe needed, the best way to secure it, and the best way to hide the supply hose. I should be able to post some more pictures tomorrow. 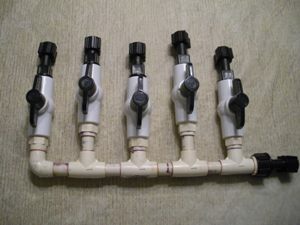 For the irrigation system, I wanted a way to control the water output to the different beds easily so I created a simple manifold out of PVC. I added valves to control the flow to each individual bed. I am not a plumber so it may look a little sloppy but I think it will do the trick. Along with the timer, hose, and drip line, this should about complete my irrigation system. I received the drip line yesterday, and bought a roll of 100′ 1/2″ irrigation line from Menard’s to use as feeder lines. The inner (black) line is the feeder and the outer (brown) is the drip line. Last year, I had a small drip irrigation system on a timer for watering my container garden. This year I would like to do the same thing, but will need some different hardware since I am increasing square footage considerably. 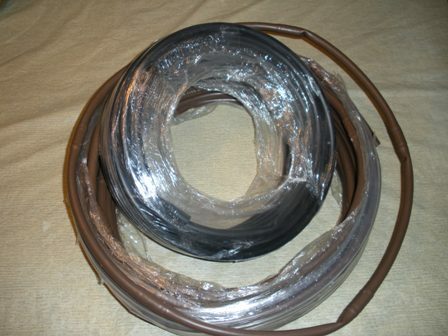 After some extensive online research, I found a few manufacturers of drip-line, each with different spacing and flow rates. I decided to go with 12 inch spacing (one per square) with .6 gph per emitter which I found on eBay for quite a deal. Ordered it today, see what it looks like in 7-10 days when it arrives.